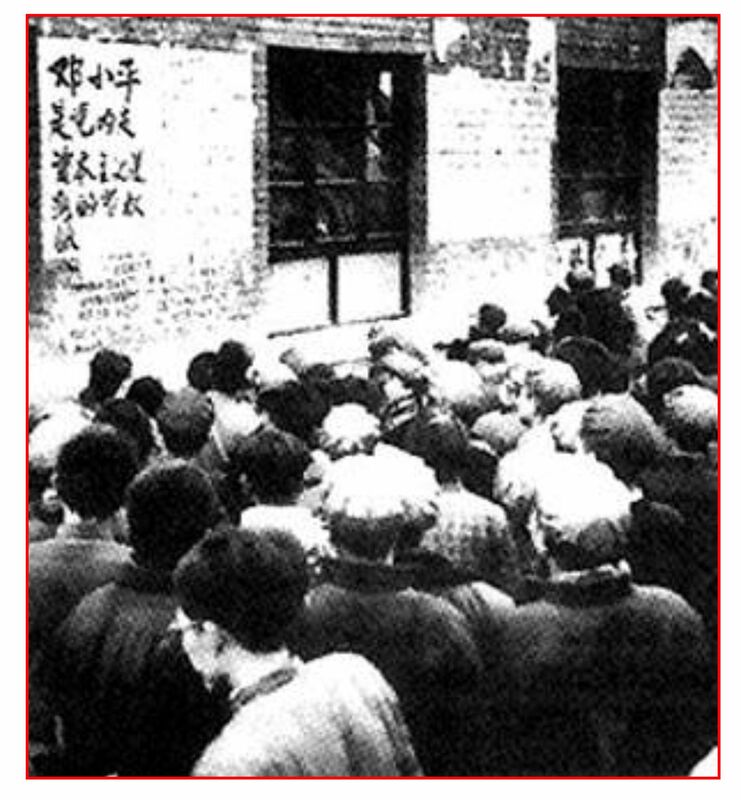 China’s Great Proletarian Cultural Revolution (无产阶级文化大革命 pinyin: Wúchǎnjiējí Wénhuà Dàgémìng) was one of the most terrifying periods in modern Chinese history. The revolution turned upon itself in a fury of denunciation and violence. The goal was to root out those who opposed the revolution. The result was a rampage of destruction. Everything old was to be done away with to make way for the new. Those associated with the old culture were punished or executed. The poster on the right (from Wikipedia) shows the Red Guard in action against symbols of religion, capitalism and culture. The slogan reads “Destroy the old world! Establish the new!” (打破旧世界 dǎ pò jiù shì jiè 创立新世界 chuàng lì xīn shì jiè ). The Cultural Revolution began in 1966, and did not really end until the death of Mao Zedong in 1976. Much of the old was destroyed; nothing new was created. In 1965 China was under great political stress. Attempts to increase the country’s industrial output – the Great Leap Forward (1958-1961) – had brought agricultural disaster and widespread famine. Russia had decided for coexistence with capitalism rather than confrontation. In 1961 Mao had denounced Khrushchev’s politics as revisionism, thus initiating the Sino-Soviet Split and the withdrawal of all Russian scientific and technical support from China. As in any society, there were corrupt as well as honest politicians. Many members of the party had used their power for personal rather than social gain. Many regions of the country had become the fiefdoms of the party bosses. Mao knew this was wrong. The pure soul of the revolution should not be adulterated with bourgeois incentives. A revolution is not a dinner party, or writing an essay, or painting a picture, or doing embroidery; it cannot be so refined, so leisurely and gentle, so temperate, kind, courteous, restrained and magnanimous. A revolution is an insurrection, an act of violence by which one class overthrows another. (Mao Zedong, from a 1927speech, quoted in 1966, p 11-12). 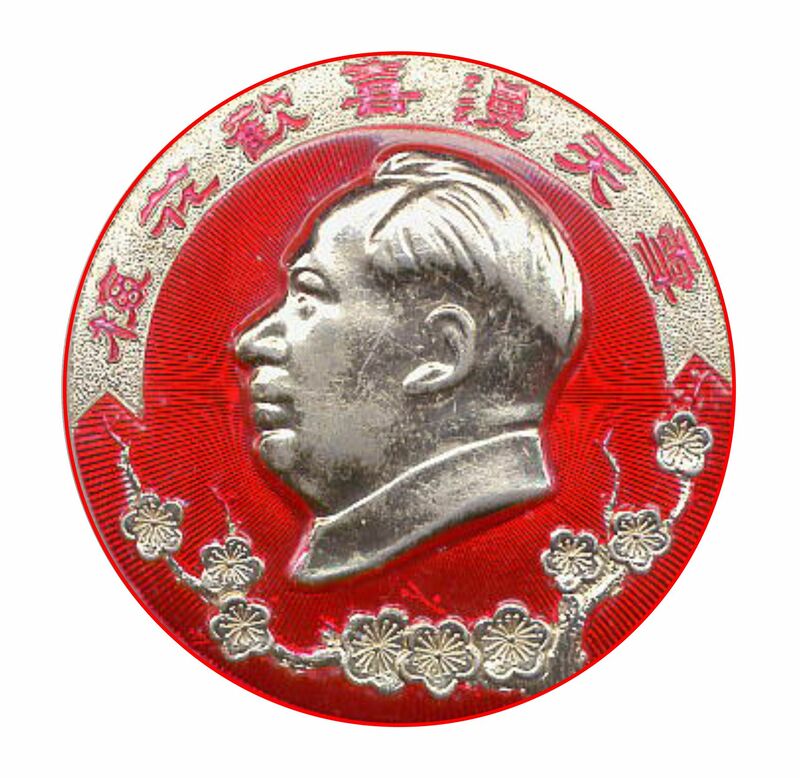 Mao badges were manufactured. The cult of personality needed to be enhanced, especially after the revisionist Khrushchev had denounced the cult of Stalin. The badge on the right includes a quotation from Mao’s 1962 poem Winter Clouds: “The plum blossoms are delighted by the snow (花欢喜漫天雪 huā huan xǐ màn tiān xuě)” The next line of the poem is “and do not care about the freezing flies.” (Barnstone, 1972, p 109). Counter-revolutionary insects were soon to face their winter. The stage was thus set for the Great Proletarian Cultural Revolution. Indeed, many of the events had a theatrical character (Heberer, 2009). The revolution may have begun with the play, Hai Rui Dismissed from Office, written by the historian Wu Han in 1959 and first performed in 1961. This told the true story of how an honest offical had been imprisoned in 1566 by a corrupt Ming emperor. Wu Han was deputy to Peng Zhen, the mayor of Beijing and a major supporter of Deng Xiaoping. In November, 1965, a review of the play, written at Mao’s instigation, accused the author of covertly criticizing Mao for dismissing Peng Dehuai. Art must not question the revolution (or its leader). Revolution and reason are not easy companions. Hai Rui should have been a revolutionary hero. Yet cunning and devious counter-revolutionaries must have used his story to question the leadership of Mao and derail the great revolution. Wu Han was jailed in 1966 and died in prison in 1969, possibly by suicide. Peng Zhen was deposed, but survived. The party in Beijing was in disarray. Mao could now increase his power. Those representatives of the bourgeoisie who have sneaked into the Party, the government, the army, and various spheres of culture are a bunch of counter-revolutionary revisionists. Once conditions are ripe, they will seize political power and turn the dictatorship of the proletariat into a dictatorship of the bourgeoisie. Some of them we have already seen through; others we have not. Some are still trusted by us and are being trained as our successors, persons like Khruschev for example, who are still nestling beside us. Party committees at all levels must pay full attention to this matter. (MacFarquhar and Schoenhals, 2006, p. 47). On May 25, Nie Yanzie, a professor in the philosophy department at Beijing University, together with some junior colleagues, wrote the first big character posters (大字报 pinyin dà zì bào) and affixed them to the walls of the university canteen (photograph at the left from Wikipedia). The text of the posters combined revolutionary rhetoric with denunciations of those in authority, in this particular instance members of the university’s party committee. Other posters were soon displayed in Tsinghua University (another university in Beijing). These were signed by a group of students calling themselves the Red Guard (红卫兵 pinyin Hóng Wèibīng character-by-character red protect soldier). Red became the symbol of the revolution and black the badge of the reactionaries. Big character posters became the revolution’s only literature. In July, 1966, the Great Helmsman (大舵手pinyin dà duò shǒu) went swimming in the Yangtze River. A choppy side-stoke kept him afloat – no mean feat for a 72-year old overweight chronic smoker (though his fat tissue may have increased his buoyancy). The leader was ready for battle. His followers were ecstatic – everyone wanted to swim in the river of the revolution. Mao gave a speech on August 6 supporting the big-character posters in the universities earlier that summer. Mao’s metaphorically wrote his own poster, asking the people to “bombard the headquarters” with suggestions and denunciations. The poster illustrated below commemorates the speech (source). The characters in the first line read “Bombard the Headquarters” (pinyin pào dă sī lìng bū; character-by-character: artillery strike commanding officer department). The second line reads “My first big-character poster” (wŏ de yī dà zì bào; me of one large character communication) and the third line is “Mao Zedong.” The characters on the flag mean “Revolution leads to truth” (or “To rebel is justified”): zào făn yŏu lĭ (make opposite is truth), and on the rolled up poster is dà zì bào. Both are written from right to left. 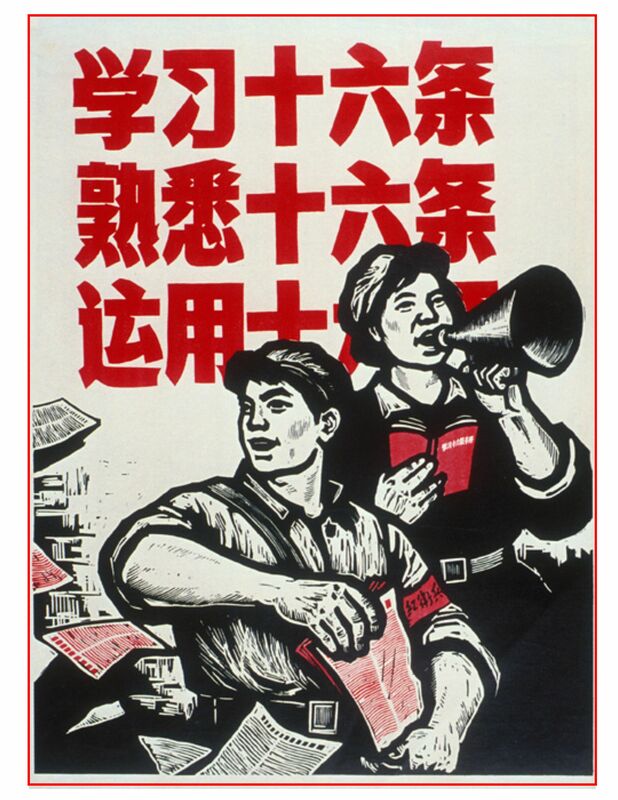 The poster on the right shows the Red Guard encouraging the masses to follow the Sixteen Points: Study the 16 Points (xué xí shí liù tiáo). Know (shú xī) the 16 Points. Use (shǐ yòng) the 16 Points. 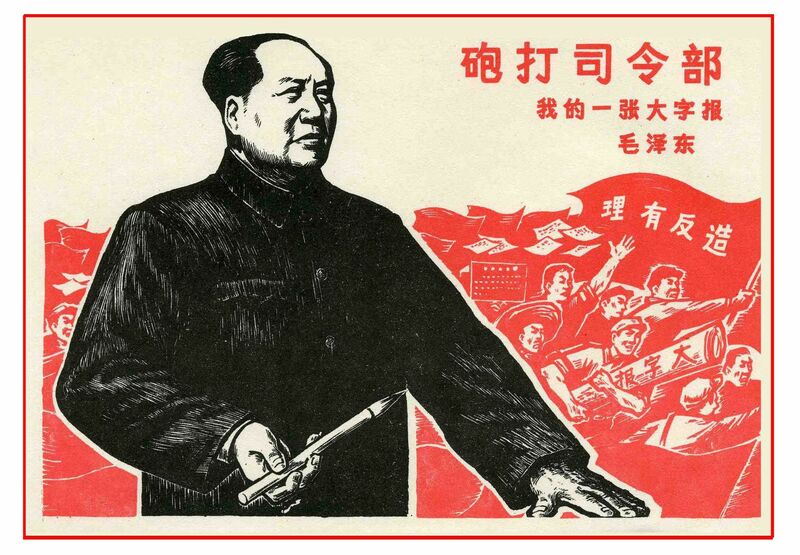 On August 18, Mao endorsed the Red Guard movement at a huge rally in Tiananmen Square. He wore the red armband that was to become the badge of the student movement. 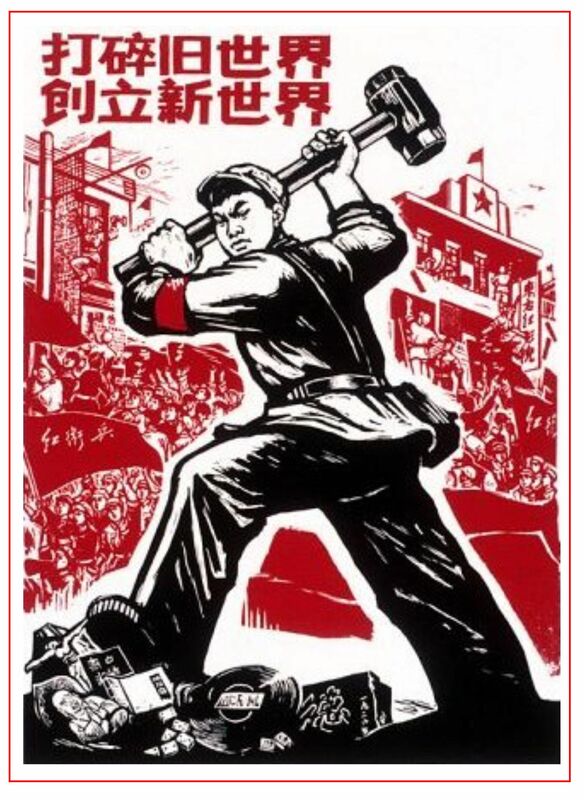 The Red Guards were encouraged to “Destroy the Four Olds and Cultivate the Four News” (破四旧立四新; pinyin: Pò Sìjiù Lì Sìxīn). The terror was unleashed. The history of the next two years is full of violence and cruelty. Books were burned and temples were desecrated (Dahpon David Ho, 2006). 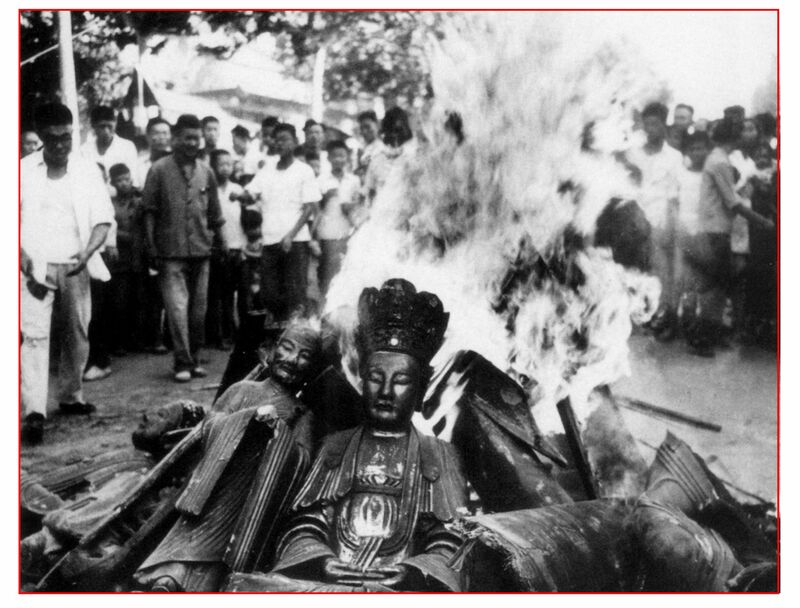 The photograph below shows the burning of Buddhist statues (from MacFarquhar & Schoenhals, 2006). A video shows more destruction of religious symbols. The Chinese Premier Zhou Enlai intervened to preserve some of the great cultural buildings such as the Imperial Palace in Beijing and the Potala Palace in Lhasa Tibet. In 1967 the Red Guards were formally enjoined not to sabotage state property. The idea was promoted that cultural relics were part of the nation’s glorious revolutionary traditions. Nevertheless, much had been destroyed before the Red Guards became quiescent. Artists, intellectuals, and administrators were brought before Red Guard tribunals to confess their counter-revolutionary activities. Many were harassed and publically humiliated, many were tortured, many were summarily executed. 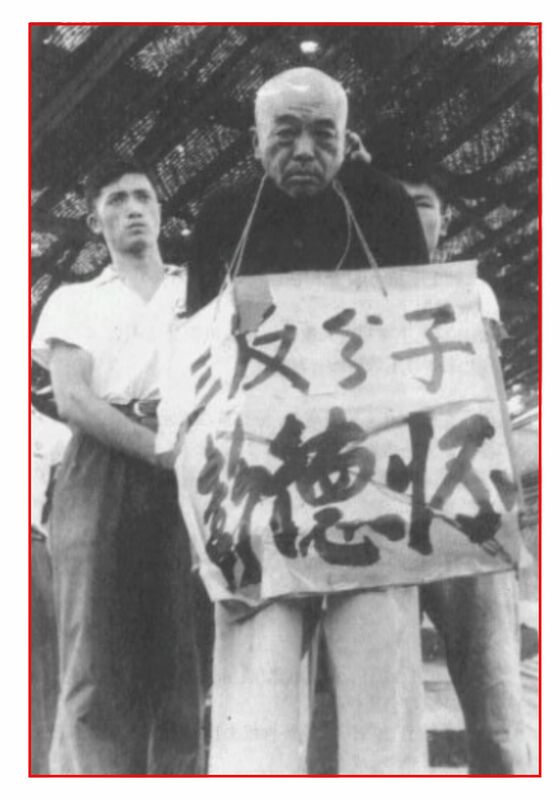 The photograph on the left shows Peng Dehuai wearing a placard telling of his sins against the revolution. (Also shown in the video). Prolonged and brutal torture did not evoke any confession, but Peng’s imprisonment continued until his death in 1974. In the provinces, the death toll ran into the thousands (Yang Su, 2006). Then I saw the accused woman. She was perhaps in her forties, kneeling in the middle of the room, partly naked. The room was lit by a bare fifteen-watt bulb. In its shadows, the kneeling figure on the floor looked grotesque. Her hair was in a mess, and part of it seemed to be matted with blood. Her eyes were bulging out in desperation as she shrieked: ‘Red Guard Masters! I do not have a portrait of Chiang Kai-shek! I swear I do not!’ She was banging her head on the floor so hard there were loud thuds and blood oozed from her forehead. The flesh on her back was covered with cuts and bloodstains. When she lifted her bottom in a kowtow, murky patches were visible and the smell of excrement filled the air. I was so frightened that I quickly averted my eyes. Then I saw her tormentor, a seventeen-year-old boy named Chian, whom up to now I had rather liked. He was lounging in a chair with a leather belt in his hand, playing with its brass buckle. ‘Tell the truth, or I’ll hit you again,’ he said languidly. . . I murmured, trying to control the quaking in my voice, ‘Didn’t Chairman Mao teach us to use verbal struggle [wendou] rather than violent struggle [wudou]? Maybe we shouldn’t…?’ My feeble protest was echoed by several voices in the room. But Chian cast us a disgusted sideways glance and said emphatically: ‘Draw a line between yourselves and the class enemy’. Chairman Mao says, ‘Mercy to the enemy is cruelty to the people!’ If you are afraid of blood, don’t be a Red Guard!’ His face was twisted into ugliness by fanaticism. The rest of us fell silent. Although it was impossible to feel anything but revulsion at what he was doing, we could not argue with him. We had been taught to be ruthless to class enemies. Failure to do so would make us class enemies ourselves . . . Outside the door, I saw the woman informer . . . As I glanced at her face, it dawned on me that there was no portrait of Chiang Kai-shek. She had denounced the poor woman out of vindictiveness. The Red Guards were being used to settle old scores. The country was in chaos. Yet Mao was in supreme control. He had rid the country of his main adversaries. 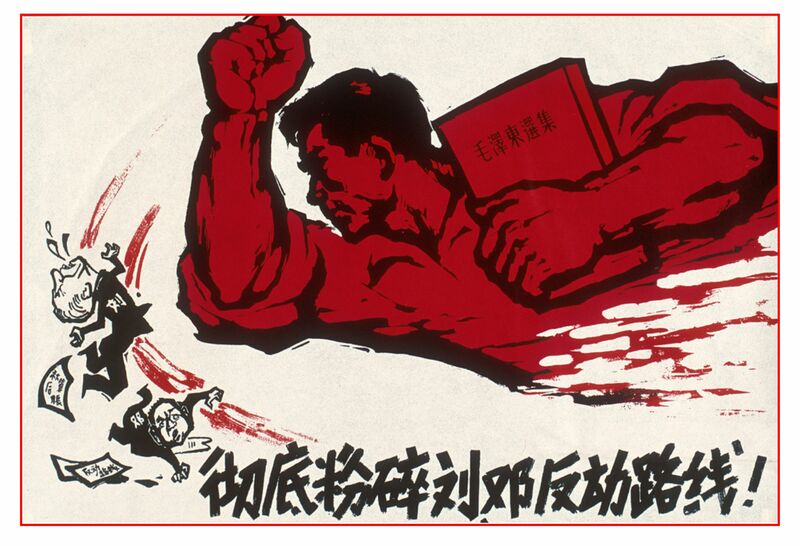 The poster below exhorted the reader to “smash completely the Liu Deng counter-revolutionary line.” Similar posters are illustrated in Landsberger & van der Heijden (2009). Deng Xiaoping was exiled to work in a tractor factory. Liu Shaoqi was deposed, imprisoned and tortured, ultimately dying in 1969. To quell the furies that he had unleashed, Mao called upon the army. Under threat, the Red Guards were disbanded and sent to the countryside to do manual labor with the peasants. The killings decreased but the fear persisted. The greatest excesses of the Cultural Revolution were largely over by the end of 1968, but the revolution continued until Mao’s death in 1976. Administrators and members of the Communist Party were denounced and exiled. The country became ungoverned. The terrible violence that occurred during the Cultural Revolution was largely mediated through the Red Guards. These were mainly university students. High-school students were also involved, but their actions were often more imitation than instigation. Why did these young and intelligent people turn to such cruelty? Young people can be very passionate about ideas. Yet they lack experience. They have not learned that emotions can be mistaken. They have not seen how everything contains both good and evil. They have not understood that the right path is often not the first one. Young people rebel against authority. Rebellion is one way to independence. Power comes to those who resist the power of others. The young had long been subservient to parents and to teachers. Some of the excesses of the Cultural Revolution may have been equivalent to exaggerated role-reversals. The Red Guards punished their victims with beatings and with dunce-caps as though they were naughty children. Young people need a cause. They have to join together with their fellows to fight for what is right. The struggle can be against Fascism for the volunteers who went to Spain in the 30s, against the counter-revolutionaries in the Red Guards in China in the 60s, or against Western Imperialism for the Jihadists who are now in the Middle East. There is often little telling if the fight is right or wrong. Why did this great disaster happen? The precipitating context was the impoverished state of the country. The revolution had not achieved its goals. Poverty and hunger had not been eradicated. Class structure had not been abolished. A different elite now held power: corrupt party members had replaced the capitalist exploiters. Easier to believe that the revolution had been betrayed than to consider that the revolution had been mistaken. A return to the basic principles could perhaps save the ideals of communism. Into this state of despair came the cunning and the drive of Chairman Mao. Rather than accept any responsibility, he shifted the blame to others. He tapped the energy of the people and pulled all the strings needed to do away with all those who disagreed with him. Mao was old and paranoid. He could not brook criticism and could not change his ways. He attempted to destroy all those who thought differently from himself. The fate of despots is to have no friends. The most amazing thing about Premier Zhou Enlai is how he was able to attenuate some of Mao’s excesses and yet survive. At the end, however, Mao even tried to erase Zhou from history, banning any public mourning after his death in 1976. 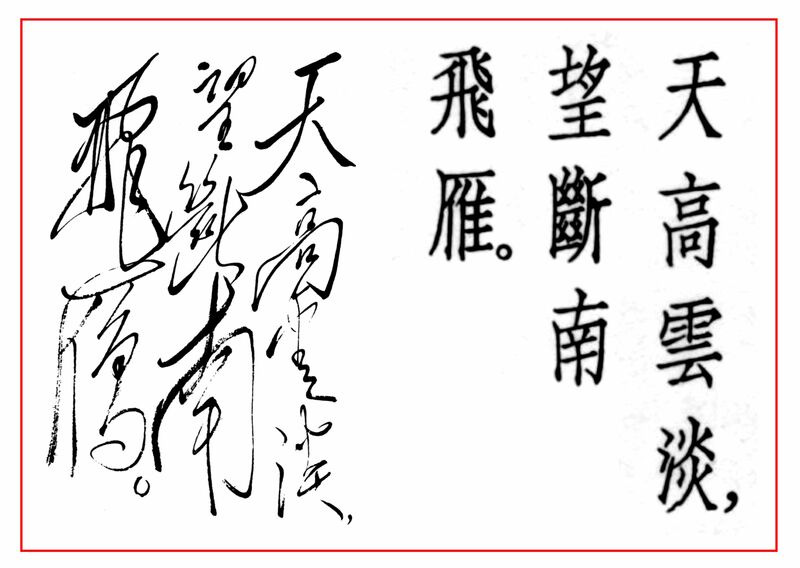 The poem and the calligraphy are in the style of the old masters. In art, Mao was far from revolutionary. A comprehensive review of this time is MacFarquhar & Schoenhals, 2006; briefer considerations are Heberer, 2009, Kraus, 2012, and Wikipedia. Domes, J. (1985). Peng Te-huai: The man and the image. London: Hurst & Co.
Hawks, S D. (2010). Summoning Confucius: Inside Shi Lu’s Imagination. In Richard King (Ed. ), Art in turmoil. The Chinese Cultural Revolution, 1966-76. (pp. 58-90). Vancouver: University of British Columbia. Jung Chang (1991). Wild Swans: Three Daughters of China. London: Simon and Shuster. Kraus, R. C. (2012). The Cultural Revolution: a very short introduction. New York: Oxford University Press. Landsberger, S. R., & van der Heijden, M. (2009). Chinese posters: the IISH-Landsberger collections. Munich: Prestel. See also the webpage. MacFarquhar, R., & Schoenhals, M. (2006). Mao’s last revolution. Cambridge, MA: Belknap Press of Harvard University Press. Mao Zedong, (1964/1966). Quotations from Mao-Tse-tung. Beijing: Foreign Languages Press. Mao Zedong (translated by Willis Barnstone and Ko Ching-po, 1972). The poems of Mao Tse-tung. New York: Harper & Row (reprinted 2008 by University of California Press).